Man says NASA should be more careful before asking people to wake at 4:30 a.m.
(CNN) -- There wasn't a cloud in the sky early Friday when Dave Samuels trained his telescopes at the moon, hoping to catch a glimpse of a NASA rocket striking the lunar landscape. The moon, shown shortly before NASA's rockets hit on Friday morning. "We saw nothing," he said. Samuels is vice president of the Fremont Peak Observatory near Monterey, California, which had invited members of the public to watch Friday's NASA mission through its telescopes. 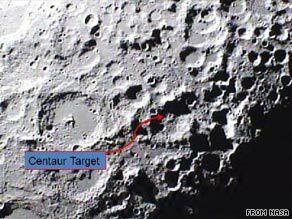 The lunar strike happened shortly after 4:30 a.m. on the West Coast (7:30 a.m. ET). NASA had encouraged everyone around the country to host "impact parties," saying the plume of dust generated by the lunar impact would be visible through "mid-sized backyard" telescopes 10 inches or larger. It said the chances of seeing the plume were greater for people living in areas that were still dark. The space agency even posted an interactive map on its Web site so people could find "a public event near you." NASA officials had said the impact of the Centaur upper-stage rocket would result in plumes of dust of more than 250 metric tons. After it hit, the debris was analyzed by a satellite -- launched along with the rocket -- that traveled through the dust cloud before its own impact on the moon. The goal of the $79 million mission was to determine whether there is water on the moon. After the impact, NASA officials called the mission a success, saying the satellite sent back a good amount of data that now will be analyzed. Jennifer Stracener of Vilonia, Arkansas, said she got up early to watch NASA's live telecast of the impact. She was disappointed, and posted her reaction on CNN's iReport.com. "These was no plume, no nothing," she said by phone. "It just kind of blacked out." She said the telecast did not show the rocket's impact clearly. "I was looking for some action -- something happening," she said. "I think a lot of people were, because they [NASA] hyped it up, you know. ... No one saw anything." Stracener woke up her husband and two children to see the lunar crash. She said she wishes she hadn't. Darrick Gray, a high school science teacher near Kansas City, Missouri, had planned to take some of his students to the nearby Powell Observatory to watch the lunar impact through their telescopes -- but they decided to skip the field trip because of bad weather. "This is truly a once-in-a-lifetime thing," Gray had said beforehand. Gray -- who is also the director of the Astronomical Society of Kansas City -- said he had hoped the mission would influence his students to think about pursuing careers in science. "Being as we do live here in Missouri, we're away from the hub [of astronomy]," he explained. "We're not in Florida, we're not in Texas, we're not in Silicon Valley -- it's not something they're used to seeing. NASA held an all-night party at Ames Research Center -- located just outside San Francisco -- which was directing the mission. There were movies, music, food and guest speakers, and it culminated with a live transmission of the lunar impact. "I would have loved to see, you know, huge amounts of dust flying up and ejecta, but we didn't," said Liza Coe, who attended the Ames event. "I thought it was so neat being able to see just as we got closer and closer to the moon and realizing that that was really happening right now. "It wasn't just a picture of the moon that somebody was putting up." Back at Fremont Peak Observatory, even though most of the 50 people who attended the "impact party" were disappointed, they were good sports about the "failure," Samuels said. Even Samuels, who has been an astronomer since he was 15 years old, said he got a lot out of the viewing party -- which he said was standing-room only. "I don't look at the moon so much because it's always there ... so I got to know the moon's craters better," he said. "And I think the people that attended, some of them that were disappointed, [still] felt like it was worth coming and being part of something that was going on." He said he hopes the event generates more support for the observatory, which is run by volunteers. It is located in Fremont Peak State Park, which is on a list of state parks that could close because of California's recent budget cuts. "We're trying to promote interest in the peak and every single person that came was part of that," he said. "They all learned something." Fremont Peak Observatory has a 30-inch telescope that Samuels described as "the most accessible public telescope in the [San Francisco] Bay area." He said he hoped that the reason they didn't see a plume from the rocket impact wasn't because of "another case where somebody forgot to carry the one" -- a reference to incorrect mathematical computation, which was blamed for the failure of the Mars Surveyor Climate Orbiter mission to Mars in 1999. He suggested that next time, NASA might want to be "a little more careful suggesting people should get out of bed at 4:30 in the morning and haul their kids out there." CNN's John D. Sutter contributed to this report.